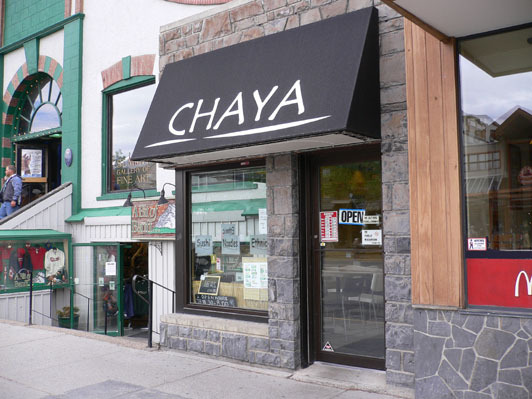 Chaya Restaurant - A taste of Asia right on Banff Ave! TaxiMike - Such fantastic asian food from such a small place! In the Best Dinner Category. 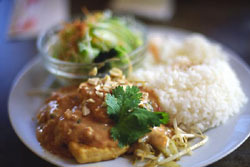 A taste of Asia that won't break the budget! JohnHarveyPhoto.com - This was really, really good. As previous meals were common food for me (read - veggie burgers), so this meal was a real treat. The restaurant is run by a Japanese woman and obviously caters to both the overseas tourists and the overseas workers. http://www.abcanada.jp/chaya (Japanese Site). Geocities.yahoo.co.jp (Japanese Site).